MET ÉIREANN HAS issued two Status Yellow weather warnings for coastal counties as strong winds sweep in. The meteorological service said coastal areas of Donegal, Galway, Leitrim, Mayo, Sligo, Clare, Cork and Kerry will be battered by westerly winds with mean speeds of 55 to 65 km per hour and gusts of 100km per hour tonight and into tomorrow. 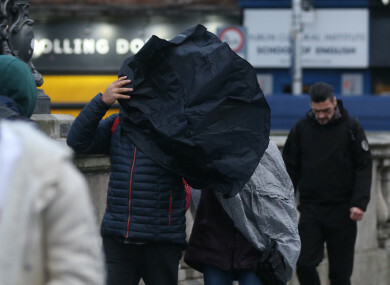 A yellow alert is also in place for Dublin, Louth, Wicklow and Meath as the east coast is set to be hit by gusts up to 90 kilometers per hour. The warnings are set to remain in place until the early hours of tomorrow morning. A marine warning has also been issued as winds will reach gale force 8 or strong gale 9 tonight on all Irish Coastal Waters and on the Irish Sea. Status Yellow warnings are the national weather service’s least severe alert. They advise people to be aware of weather conditions in their area. The inclement weather has led to the cancellation of Dublin Zoo’s Wild Lights event today and tomorrow due to safety concerns. “This decision was made because the health and safety of our visitors, staff and animals is a priority at all times,” the zoo said. Ticket holders will be fully refunded automatically and there is no need to contact the zoo. Met Éireann is forecasting that windy and rainy conditions will continue into tomorrow night. Lowest temperature will be around 5 to 7 degrees. Sunday is set to be a brighter day with some sunny spells and scattered showers, these will mainly affect the west and northwest. Email “Two weather warnings issued as winds batter coastal counties”. Feedback on “Two weather warnings issued as winds batter coastal counties”.